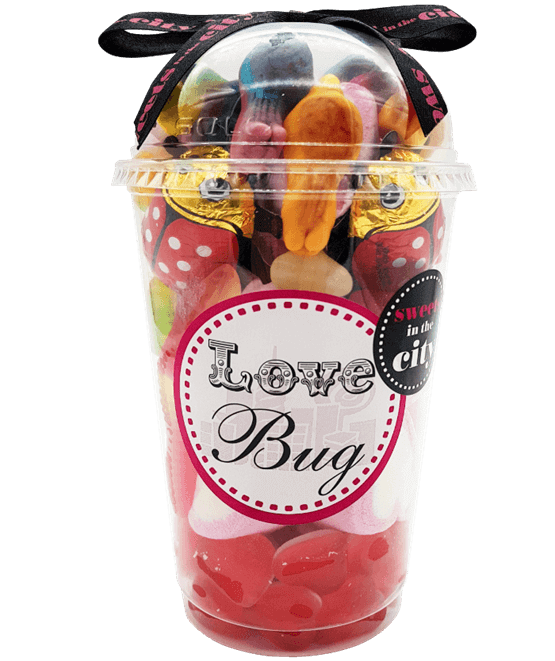 Love bug sweets sure to put a smile on any sweet lover's face! Our Love Bug gift jar is jam-packed with tasty sweet treats. 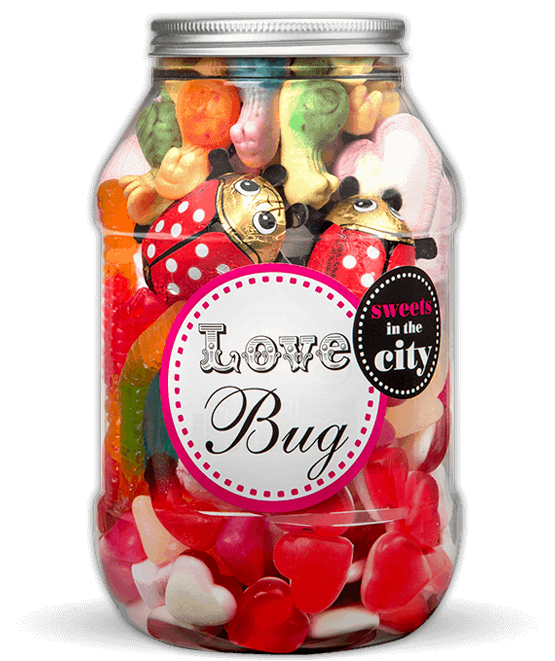 From soft to chewy, this jar has it all - it's the perfect romantic gift for that special sweet someone in your life! 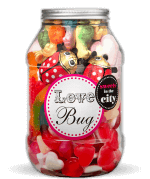 Treat your loved one to this cute and personal romantic gift. 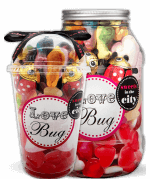 Filled with love bug sweets such as chewy hearts, chocolate ladybirds and gummy bugs, it's a unique gift that any romantic is sure to love. For further information on our collection of Love Bug sweets, be sure to get in touch with us today! Product 1: Glucose Syrup; Sugar; Water; Pork Gelatine; Maltodextrin; Acid: E330; Flavourings; Colours: E100, E120, E141; Vegetable Oils (Palm Kernel, Coconut) Glazing Agents: Beeswax, Carnauba Wax. Product 2: Glucose Syrup; Sugar; Dextrose; Gelatine; Acid: Citric Acid; Flavourings; Fruit and Plant Concentrates: Aronia, Blackcurrant, Elderberry, Grape; Glazing Agents: Beeswax, Carnauba Wax; Elderberry Extract. Product 3: Sugar; Glucose Syrup; Cornflour; Acid (Citric Acid); Glazing Agent (Shellac, Carnauba Wax); Palm Oil; Flavourings; Stabiliser (Gum Arabic); Colour (Anthocyanins). Product 4: Glucose-Fructose Syrup; Sugar; Water; Pork Gelatine; Maize Starch; Flavourings; Colourings: E162. Product 5: (Cocoa: 30% minimum, MILK Solids: 14% minimum). Sugar; Cocoa Butter; Whole MILK Powder; Cocoa Mass; Sweet WHEY Powder; Emulsifier: SOYA Lecithins; Bourbon Vanilla Extract. May contain traces of HAZELNUTS and PEANUTS. 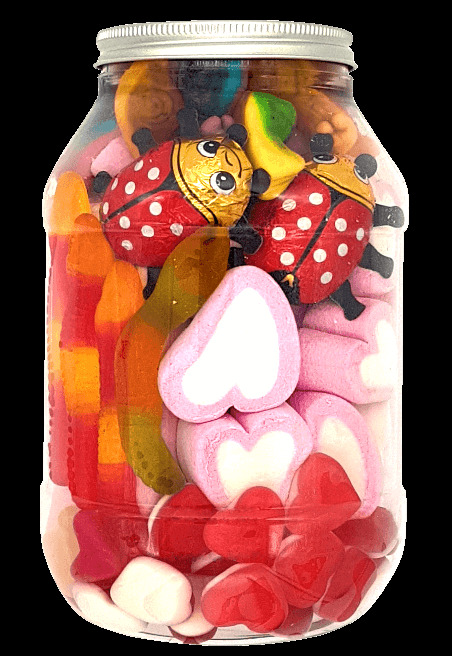 Product 6: Glucose Syrup; Sugar; Gelatine; Humectant: Sorbitols; Acids: Lactic Acid, Citric Acid; Invert Sugar Syrup; Modified Potato Starch; Gelling Agent: Pectins; Flavourings; Fruit and Vegetable Concentrates: Lemon, Safflower, Radish, Carrot, Blackcurrant; Acidity Regulator: Sodium Citrates; Vegetable Oils (Coconut, Palm Kernel); Glazing Agent: Beeswax, Carnauba wax; Colours: E100, E120, E133. For allergy advice, including cereals containing GLUTEN see ingredients in bold. Valentines gifts for my nieces and nephews. They loved them!